A few weeks ago, my parents put together a package with some presents for Lucy and January’s birthdays. We’ve received packages before, and it usually involved a simple trip to the local post office, a flash of our passport, and then we were good to go. This time, however, my parents made the well-meaning mistake of declaring the value of the contents of the package at $100, not knowing that Czech customs only allow gifts of a maximum value of $49 to be sent into the country without requiring the payment of an additional tax by the recipient. Let me give you a rundown on what the process of retrieving this package looked like. Lucy and I got home from her preschool to find a package slip in our mailbox. This wasn’t too unusual—there’s really not a great place to leave packages in our apartment building, so anytime something larger than a letter is delivered we get a claim slip that requires us to go to the post office. It’s only about a quarter mile walk, so no big deal. We walked over and stood in the package pickup line for about 10 minutes to find that we were in the wrong line; The woman at the counter was very helpful, though, and went to check on it for us anyway. She took our claim slip, stamped it a few times, asked me to sign it, and then gave us a small envelope. On opening it, we found several documents (in Czech, understandably) along with a photocopy of the customs form from the package my parents sent. I took a disappointed daughter home and went online to see if I could figure out what the document was all about. It turned out to be a document explaining that we would need to pay a tax to pick up the package, and that would need to be done a different post office. I wrapped up work a little early and headed out to the west side of the city to pick up our package. It wasn’t very far away, but it did require a rare two-tram-ride trip. I arrived at what appeared to be a pretty major headquarters for the postal service. I waited in line at the first room I entered and was told that the office I wanted was on the third floor. So I walked up to the third floor and found the office number I was told to go to. After waiting in a short line, I handed in the letter I got at the post office the day before, had it stamped a few more times, and was given the original customs form from the package and told to go down the hall to another waiting room. The idea of a line, or a queue, in Czech culture is really fascinating. I’ve been here for nearly four months and still haven’t quite wrapped my head around the politics of waiting in line. Sometimes there’s a single line for all windows and sometimes there’s multiple lines for multiple sets of windows. In this case, however, there was a room full of chairs, no line, and a single door behind which were six windows. I just took a seat for about five minutes, trying to see if I could figure out the system. Above the door was a sign with six pairs of words, “volno”Available in green and “obsazený”Occupied in red. Occasionally one of the green “obsazený” signs would change to “volno” and a seemingly random person would get up and walk through the door. I finally asked and was told that it was a sort of honor system where people just remembered the order they came in and went in when the “available” light came on. After 10 or 15 minutes of waiting, my turn came up and I went in. I found the desk with the corresponding number from the lighted board and gave them the original customs form where I was informed I would need to pay a tax to pick up the package. Great, I said, I’ll pay whatever to get out of here. She proceeded to print off a few forms, stamp them about half a dozen times and pointed me toward a window across the room that I should take them to. A few steps later I was told my total—about 281kčAbout $11—and I then paid it. Two receipts were printed, each of which was signed and stamped 2 or 3 times, and I was told to return to the window I was at previously, where my receipt was taken and stamped a few more times and I was told to return again down the hall, to the place where I received the original custom form. Again, waiting in a short line, I gave my stamp-filled paperwork to the woman who printed off some more papers, stamped them again, asked me for a 99kčAbout $4 processing fee, and said I should take this new paperwork literally four feet away to get my package. One more printed form, two stamps and a signature later I finally had my package in my hands! I paraded down the three flights of stairs with the package raised above my head with We Are the Champions playing in my head and went to catch the tram to pick up Lucy from school. All told, this process took up about two hours of my life. 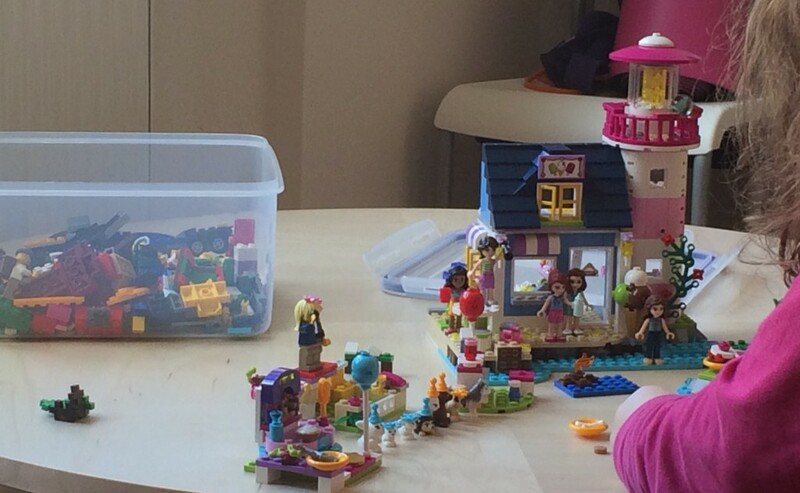 But Lucy and January did get some awesome LEGO sets out of it, so they would probably tell you it was worth it. But please, if you’re sending a package to the Czech Republic and value the sanity of its recipient, don’t value it at more than $49USD.